The TIARA Consortium of European Research Institutions, the ARIES Integrating Activity for particle accelerator R&D, the AMICI Coordination and Support Action for accelerator and magnet technological infrastructures. 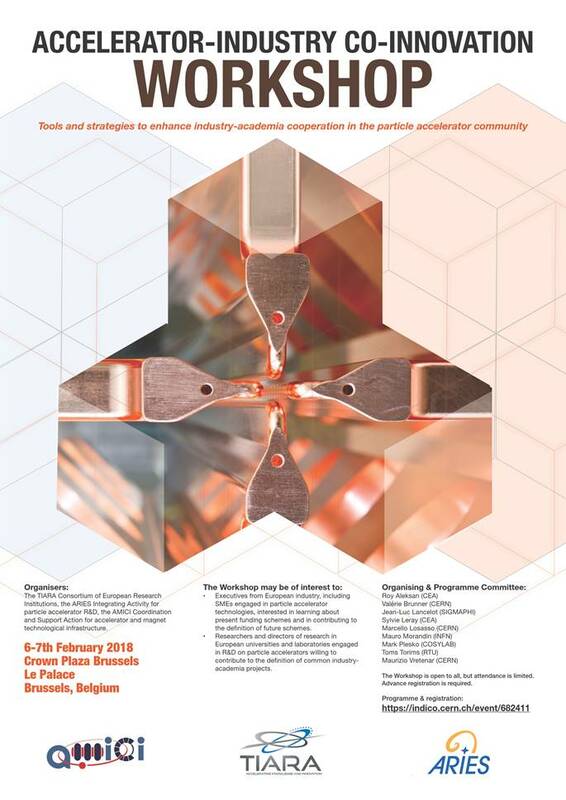 To foster discussion on most effective ways to develop co-innovation with industry in Europe. To identify sustainable structures, possible funding schemes and financing mechanisms. To contribute to the definition of new EC instruments to boost co-innovation. To provide a communication platform to all relevant stakeholders: policy makers, academia, industry and scientific management. Companies with R&D or production capacities, having potential for collaborative innovation. Academia – scientific institutions represented in TIARA/ARIES/AMICI. Identify potential barriers in co-innovation between industry and academia. Provide industry with up-to date, relevant and quality information regarding newest developments in the accelerator community and instruments to support them. Discuss initiatives and scenarios for fostering co-innovation in particle accelerators, supported by the accelerator community at large – business and academia. Networking between industry and academia, improving the integration of industry in the particle accelerator community.